At City Hall press conference were, from left, Msgr. Kieran Harrington, Councilmen Eric Ulrich and David Greenfield, Rabbi Mordechai Besser and Sam A. Sutton. Msgr. 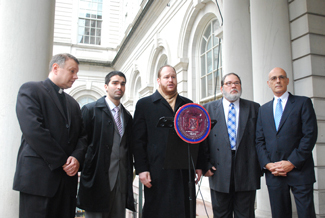 Kiernan E. Harrington, Vicar for Communications for the Diocese of Brooklyn, Rabbi Mordechai Besser, principal of Manhattan Day School, and Sam A. Sutton, co-president, TEACH NYS, on the steps of City Hall Dec. 7 to hail the agreement between Gov. Andrew Cuomo, Senate Majority Leader Dean Skelos and Assembly Speaker Sheldon Silver. Only public schools had been exempt from the tax. “Simply put, this is an issue of fairness and equity. It’s not right to hold private schools to a different standard than public schools. I applaud Governor Cuomo, Speaker Silver and Senate Majority Leader Skelos for addressing this double standard, which will help yeshivas and other private schools continue providing quality education for our children. I am optimistic that this is the beginning of a turning of the corner in terms of equity for state aid to private schools,” said Greenfield. “This common-sense agreement recognizes the important role private and parochial schools play in our neighborhoods. It wasn’t fair to tax them at a higher rate than public schools, and I applaud the state for eliminating this tax burden for all schools,” Ulrich said. “For more than two years, downstate religious and independent schools have been subject to an onerous payroll tax to help fund the MTA, while their public school counterparts were reimbursed by the state for the same tax. With Catholic schools in crisis across the state, this extra burden on schools and tuition-paying parents exacerbated an already tenuous situation,” said Barnes. “While today’s action will not relieve the enrollment and funding crisis facing our schools, it will certainly be helpful. “We look forward to working with the governor and legislature in the upcoming session to more fully address this crisis facing parents and children in independent and religious schools, which could ultimately have catastrophic impact on all New York taxpayers,” he said. The MTA payroll tax has impacted Catholic schools in the Archdiocese of New York, the Diocese of Brooklyn and the Diocese of Rockville Centre.